Nia Coffey jumps for a tip-off. The former Wildcat is a near-certain first round pick in Thursday’s WNBA Draft. 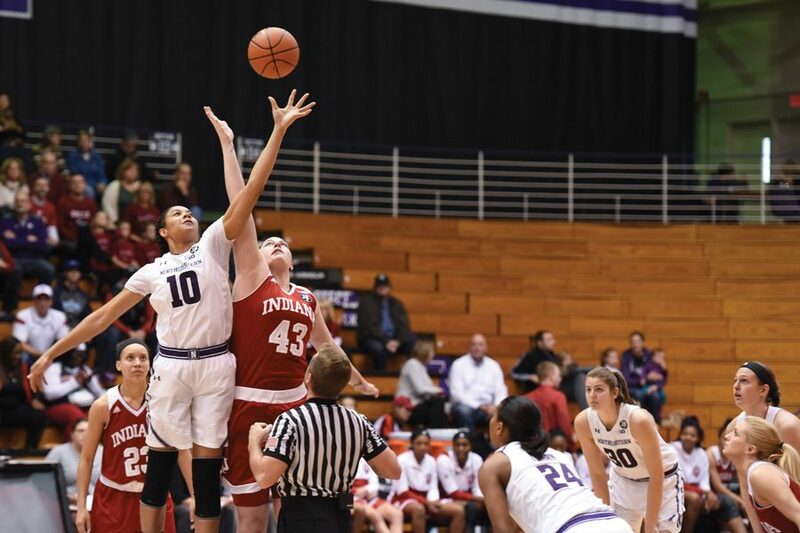 Nia Coffey has played in an NCAA Tournament and won dozens of games with Northwestern, but the most significant moment of her basketball career to date will come when her name is announced Thursday in a Manhattan auditorium. There, Coffey will be selected in the WNBA Draft, kickstarting the professional career for arguably the best player in Wildcats program history. A near-certain first round pick, Coffey could be taken as high as No. 4 overall but is more likely to be selected midway through the round. A versatile 6-foot-1 forward, Coffey averaged 20 points and 10.4 rebounds per game this season. She earned All-Big Ten first team honors all four years of her college career, and twice was named Associated Press honorable mention All-America. She is the program’s all-time leading rebounder and second-leading scorer. Though she primarily played at the ‘4’ spot for the Cats, Coffey can both shoot from the perimeter and post up defenders. She has led the fastbreak and developed a particularly effective midrange game in recent seasons. Unlike some players, such as presumptive No. 1 overall selection Kelsey Plum of Washington or South Carolina’s Alaina Coates, Coffey is not expected to make a major impact right away. Robinson and fellow ESPN analyst Rebecca Lobo both said Coffey profiles as a small forward at the professional level. Robinson added that Coffey has the requisite skills and mentality to be successful in the WNBA, but likely needs to refine her game and adjust to a position change. For her part, Coffey said she was unconcerned about her eventual selection or positional fit, saying her focus was entirely on preparing for her career and displaying her versatility. Her selection will also be significant from a program perspective. Only one NU player, Amy Jaeschke, has ever been drafted. She was a third round selection in 2011. Point guard Ashley Deary could also be taken and will likely attend a training camp after a standout performance at a pre-draft combine, McKeown said. Still, Coffey, who has been linked to the Chicago Sky either as the No. 9 pick or through trade, is the center of attention.